South Korea is a high-growth market for UK exports. In the 4 quarters to the end of Q3 2018, the UK exported £10 billion of goods and services to the country, up 17% on the previous year. In 2017, almost 7,000 British companies exported to South Korea. The South Korean public has a taste for British culture and a respect for UK goods. Many well-known UK brands like Standard Chartered, Jaguar Land Rover, British Airways, Lush, Boots and Burberry are already selling in South Korea. President Moon’s focus on emerging technologies and the Fourth Industrial Revolution presents opportunities in sectors of UK strength. FDI from the UK in South Korea was around £7 billion in 2017, 14% higher than in 2016. The South Korean government is keen to encourage foreign investors, making efforts to ease regulations and provide incentives for direct investment. There are export opportunities in a range of areas including technology, automotive, fintech, offshore wind and life sciences. South Korea has advanced technology infrastructure with high-speed internet and high smartphone penetration. South Korea aims to lead the world in the Fourth Industrial Revolution and is racing towards adoption of 5G and the Internet of Things (IoT). South Korea's government and tech industry see the UK as one of the priority countries to collaborate with on innovation. This creates growing partnership opportunities for UK businesses. Large South Korean companies are investing heavily in artificial intelligence (AI) research. Samsung Electronics, the fourth largest global investor in startups, announced that every product the company makes will have built-in AI by 2020. With strong support from the government, Korea’s telecommunication giants such as SKT, KT, LG U+ and electronics manufacturers such as Samsung are leading a roll-out of the 5G network. The South Korean automotive industry is one of the largest in the world and a major part of their economy. They are expanding into advanced technology and innovation, especially low-carbon vehicles and driverless technology. The government has created an eco-friendly vehicle programme to support the development of these technologies. By 2040, South Korea plans to manufacture 6.2 million hydrogen cars and build 1,200 charging stations. The UK is increasingly recognised in South Korea as an innovation leader, especially in driverless technology. Opportunities in this area are increasing as a result. Mobility is a key theme of the government’s smart city project. In March 2019, Hyundai Motor Group also announced plans to invest 14.7 trillion won ($13.14 billion) in R&D over a five-year period in future car technology. Financial services are the third largest service export from the UK to South Korea. The government is changing regulations and providing support to innovative financial technology (fintech) companies. South Korea’s fintech industry was, until recently, constrained by government regulation and a lack of domestic venture capital. South Korea is now seeking support from more experienced fintech markets like the UK to turn this situation around. 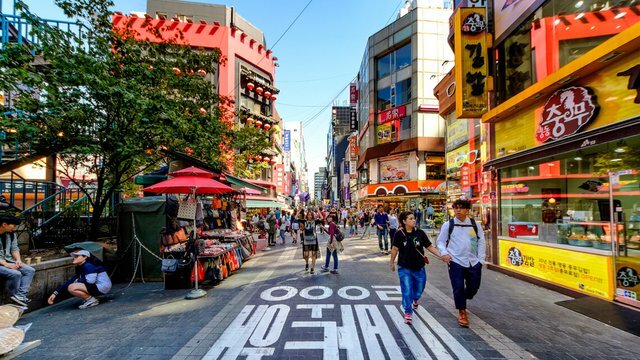 The South Korean government has introduced a regulatory sandbox, based on the UK model, to help the development of the sector. Since 2015 there has been a UK-Korea fintech bridge. Both sides are now actively looking to translate this into increased collaboration in the sector. Seoul has multiple initiatives to support fintech developments. Labs and innovation centres across the city can provide a customised programme for fintech startups (including foreign startups) at different stages of growth. In December 2017 South Korea announced Renewable 2030, a plan to greatly increase its renewable energy capacity in areas including solar and new wind. Massive government and private sector investment in offshore wind power will create opportunities for UK companies. The UK is recognised as having a world-leading offer in the supply chain. To meet their ambitious targets, South Korea will need consultancy from companies with a proven track record of success in the field. UK companies have already successfully participated in the development of off-shore wind in Taiwan, giving assurance of an ability to operate in North East Asia. UK Export Finance can be used to provide South Korean investors with credit guarantees in this new field. South Korea has a large pharmaceutical market, and its biopharmaceutical market is growing fast. It also has one of the largest medical device markets in the world. Companies and hospitals are interested in advanced technology in areas like dental implants, ultrasound, grafts and prostheses, biomaterials and PACS. Opportunities for R&D collaborations and technology transfers exist in fields like oncology, cardiology, drug discovery, metabolic diseases, and tissue engineering. South Korean companies are increasingly willing to license products from outside the country, presenting new opportunities for UK companies. South Korea ranks high for ease of doing business, but it is a good idea to take note of local regulations. South Korea has a Value Added Tax (VAT) rate of 10%. Cultural items like newspapers, books and magazines may be exempt. There are special tax exemptions under the FDI incentives scheme. For more information, see InvestKorea.org. The Korean Agency for Technology and Standards (KATS) administers and monitors Korea’s industrial standards. KATS is referenced in government regulations and technical specifications, and implemented by public agencies in procurement. They work to align South Korean standards with international ones. Country of origin labelling is needed for commercial shipments entering South Korea. The Korean Customs Service publishes a list of the country of origin labelling requirements by Harmonized System Code number (an international classification system managed by the World Customs Organisation). As a first step, we advise you to speak to an intellectual property lawyer if you think you need patent protection when exporting. You should register your patents and trademarks with the Korean Intellectual Property Office (KIPO) before you commit to deals with South Korean companies. Read guidance on protecting your intellectual property in South Korea.